Accenture is proud to announce the rollout of our latest intelligent underwriting tool, a cloud-based solution developed in collaboration with Pitney Bowes. The solution can significantly reduce the time an underwriter needs to triage a property risk and can improve overall property underwriter quality by identifying key exposures the underwriter needs to address and price. One of the major trends in underwriting today is the bringing together of data, analytics, intelligence and insight, not to replace the underwriter but to enable him or her to make more consistent, more effective and higher quality underwriting decisions in an efficient manner. Single and multi-property views to assess. The tool is designed to work with a carrier’s existing underwriting desktop and system, but it can also be used independently and supports property-schedule uploads from Excel. Its use can significantly reduce the time an underwriter needs to triage a property risk and can improve overall property underwriter quality by identifying key exposures the underwriter needs to address and price. 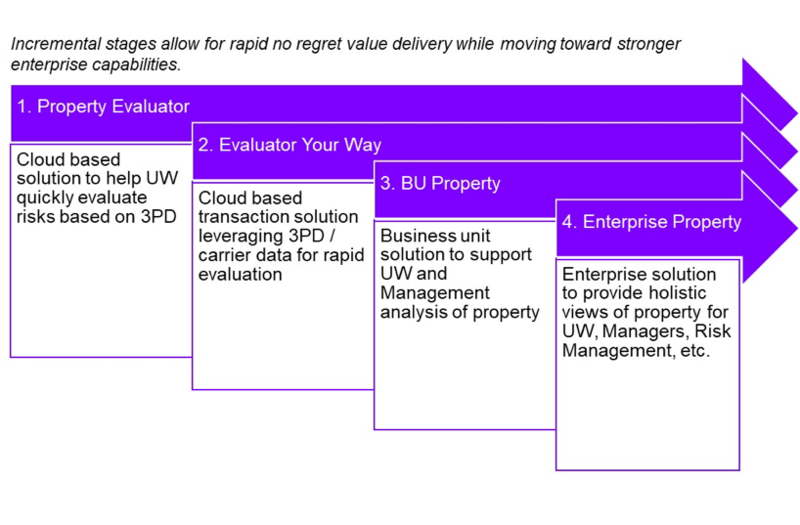 The Property Evaluator leverages Accenture’s Intelligent Insurance Solution platform and Pitney’s leading GIS information, its Spectrum Platform and third-party data. Together this provides carriers with not just a rapid out-of-the-box solution that can be deployed quickly, but also the ability to further expand the solution to other lines of business and incorporate other data sets as part of an overall intelligent underwriting future. If you are interested in finding out more about the Property Evaluator, please feel free to contact me with your comments, questions and feedback.